Vanderbilt junior Kaylann Boyd has overcome learning disabilities, concussions and questioning her own commitment to the sport in helping Vanderbilt to a 13-1, 6-0 record. Kaylann Boyd knew she couldn’t hold others accountable if she wasn’t accountable for her own actions. She knew she couldn’t expect to bring out the best in her teammates if she wasn’t working to bring out the best in herself. 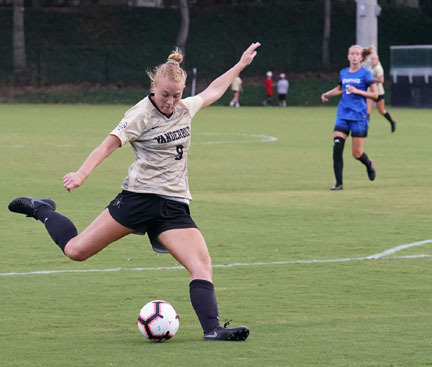 Boyd made an early impact for the Vanderbilt women’s soccer team, playing in all 19 games as a freshman in 2016 and scoring the game-winning goal against rival Tennessee in double overtime. But Boyd’s sophomore year provided some setbacks. The Atlanta native suffered a concussion during preseason training and appeared in only 12 games. She began to have doubts about her role on the team, and she struggled to push herself through training. Boyd reignited her inner fire this season to help fuel a historical run. Vanderbilt (13-1, 6-0) has won a program-record 13 consecutive games and sits atop the SEC standings. The No. 12 Commodores host No. 9 South Carolina (11-2, 5-1) on Friday night at the Vanderbilt Soccer Complex. Boyd, a junior forward, has scored a career-high seven goals this season and is averaging 54 minutes on the field. “Kaylann is really a poster child for what can happen when you push yourself to work hard. She wasn’t performing to the expectation she was capable of and didn’t want it bad enough,” explains Darren Ambrose, Vanderbilt head coach. Overcoming challenges is nothing new for Boyd. She was diagnosed with dyslexia and ADHD at age 6 and began attending Atlanta Speech School, which serves students with speech, hearing or learning disabilities. Despite the dyslexia, Boyd has been able to manage her studies at Vanderbilt. She still takes ADHD medication to help her focus in class and get her work completed at home. She has always been open about her learning disabilities. They inspired her to major in psychology at Vanderbilt with the goal of becoming an educational diagnostician to help children with similar issues. 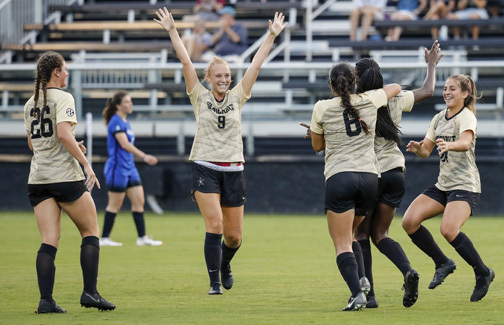 Kaylann Boyd celebrates a goal she scored during Vanderbilt’s 2-0 win against Memphis earlier this season. Boyd’s evolution on the soccer field may serve a similar purpose. Ambrose has watched many players struggle with the transition to college at some point early in their careers. Society’s thirst for instant success without leeway for setbacks places additional pressure on the maturation process. “It’s hard for some kids to understand delayed gratification and the ability to work at something over a long period of time in order to become good at it later. It’s instant everything today,” Ambrose points out. Knowing Vanderbilt needed to replace veteran leaders this season, Boyd decided to make some changes. She didn’t want to have regrets about not trying to reach her full potential. “I had to fix my work ethic. It was not as consistent as it should have been. I had to be honest with myself,” Boyd acknowledges. Boyd’s wake-up call sounded more like a beep. The infamous beep test – running from one line to another in a timed sequence – gives Boyd nightmares. She dreads the thought of even trying to complete it. Seeing players acknowledge their shortcomings and work through the process of self-discovery is one of the most rewarding parts of coaching for Ambrose. Vanderbilt reached the NCAA tournament last season for the first time in more than a decade and recorded their first NCAA win since 1998. The Commodores added an infusion of young talent this season that has made immediate contributions and meshed well with the returning players. Having gone through her struggles last season, Boyd is grateful for the role she’s playing this season. Her first priority is helping Vanderbilt win, but her purpose will always be bigger than soccer.